THE CHRISM MASS | The Parish of "Our Lady Of Furness"
Today, an important liturgical celebration occurs that only takes place in the cathedral, but touches many lives in every parish in the diocese. 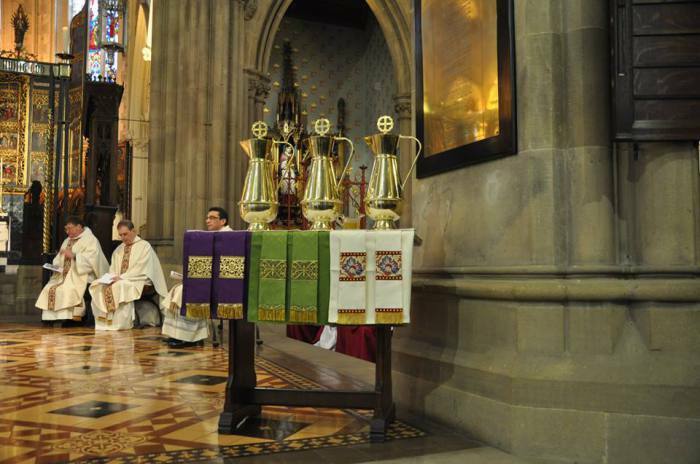 It is, of course, the Chrism Mass at which the Holy Oils to be used in every parish are consecrated, blessed and distributed. It is also the occasion at which the priests of the diocese concelebrate Mass with the bishops to manifest the unity of the presbyterate (the priests) with the episcopate (the bishops). During the celebration all renew their priestly vows. The Chrism Mass is an important and unique example of Church with priests and people gathered for a significant event in the life of the local diocese. The renewal of priestly vows and the blessing and dissemination of the Holy Oils are necessary and life-affirming actions in carrying out the day-to-day ministry in every one of our churches. There are three Holy Oils used in anointing for various occasions. The Sacred Chrism is used in the sacraments of baptism, confirmation, holy orders and in the dedication of a church. Sacred Chrism is consecrated (as opposed to the other oils which are blessed) and only a bishop may do so. It is olive oil mixed with balsam. During the consecration the bishop breathes on the oil symbolizing the consecration by the Holy Spirit. In addition to the Sacred Chrism the bishops blesses the Oil of the Sick and the Oil of the Catechumens. Both oils are olive oil, but, unlike the Sacred Chrism, there is nothing added. In the early Church the Oil of the Catechumens was referred to as the Oil of Exorcism. In the baptism of an infant, the child is anointed on the breast and the priest anoints the child in the name of Christ asking that he will strengthen the child against the power of Satan. For adults, the anointing with the Oil of Catechumens, which may occur before baptism, is to grant the individual the strength to persevere in their journey and to overcome bonds of the past and the opposition of Satan. Anointing of the sick is found in James 5:14, “If anyone among you is sick, he should summon the presbyters of the church, and they should pray over him and anoint [him] with oil in the name of the Lord.” The Oil of the Sick is used in the anointing of those seriously ill or in danger of death in the Sacrament of the Anointing of the Sick (formerly known as Extreme Unction). After the Chrism Mass, priests return to their parishes with the Holy Oils to be used during the next year at all of those occasions that are so very important in the life of the Catholic Church and her people. A good number of parishioners from our parish left this morning to attend the Chrism Mass. 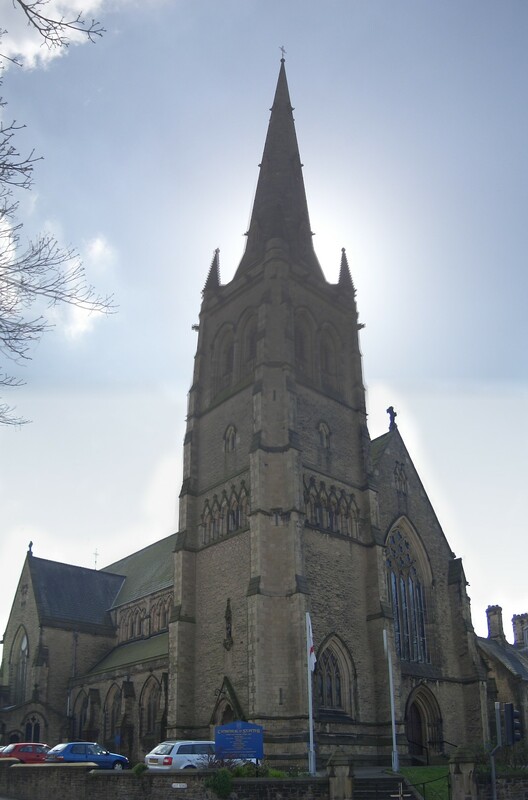 Come and join us tonight for the Mass of the Lord’s Supper 7pm At St Mary’s Church Duke Street.